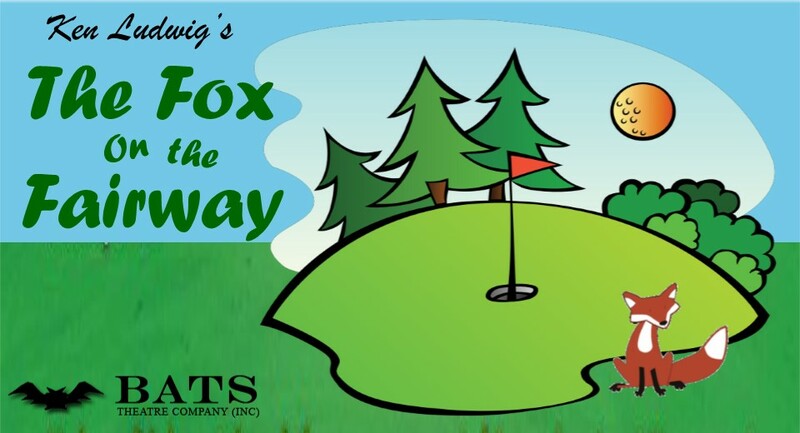 BATS Theatre Company Inc. are pleased to present The Fox on the Fairway, a farce by Ken Ludwig. The Fox on the Fairway takes audiences on a hilarious romp which pulls the rug out from underneath the stuffy denizens of a private country club. Filled with mistaken identities, slamming doors, and over-the-top romantic shenanigans, it’s a furiously paced comedy, on par with a great night out. Quail Valley Country Golf Club prepares to take on archrival Crouching Squirrel in the Annual Inter-Club Golf Tournament. With a sizable wager at stake, the contest plays out amidst three love affairs, a disappearing diamond, objectionable sweaters and general mayhem. A cast of six players take you through this delightful romp, which opened in Virginia USA in 2010. All tickets $30. All ticket proceeds go to the Buderim Foundation. Evenings: Saturday 29 September; Friday 5 and Saturday 6 October 2018, at 7:30pm. Matinees: Sunday 30 September and Saturday 6 October at 2:00pm. Belfry Bar open for all performances. David is originally from Tasmania. His baptism in theatre came from university in both revue and straight drama, to be followed after graduation with amateur productions of dramas, musicals and character roles in ballet. After emigrating to Canada in 1969, like so many teachers, he immediately became immersed in amateur and college theatre productions, until in 1980 he quit teaching to enrol in the Masters in Directing programme at the University of Victoria in British Columbia. For the next ten years he worked with professional fringe companies travelling as a theatre consultant, directing, acting and doing workshops. With time passing and no fortune in sight, be returned to teaching English and Drama until retirement in 2010. He now resides in Buderim. David has performed and directed a number of times for BATS, most recently directing Night Must Fall in 2017, and we welcome him back directing in this production. Peta has taught Drama to over 3000 students privately, in youth theatre and at various primary and secondary schools on the Sunshine Coast since 2000. She is currently studying Social Work and Drama Therapy and has a keen interest in promoting the Arts that connect to social issues. Peta has directed over 50 productions and has written numerous plays and adapted works for the stage. She also has a keen interest in classic literature and world history and many of her plays reflect this love. Shakespeare is one of Peta’s not-so-secret passions and the obsession extends to her knowing several plays word for word having acted and directed them on multiple occasions. For BATS, Peta directed The Crucible (2007) (STAAR Award for Best Drama), To Kill a Mockingbird (2008), Pippin, Midsummer Night’s Dream (STAAR Award in 2000 for Best Production, Lighting, Stage Management), Oklahoma, Pippin, and Theatre Festival, One Act Play seasons. She taught BATS Youth Theatre from 1998 to 1999 before it became BYTE. Her acting credits for BATS include Eponine in Les Miserables in 2008, and Tybalt in Romeo and Juliet earlier this year. Previously Peta has been on the BATS committee from 2005 until 2009. This year we welcome Peta Beattie once again to the BATS Committee in the capacity of Production Manager. Bruce has been involved with BATS for eighteen years, where he has had a hand in most aspects of the group, including, acting, writing, directing, backstage and administration. He is currently the BATS Treasurer and an avid playwright, with many of his plays having been produced by BATS. He last performed on the BATS stage in the comedy, A Little Murder Never Hurt Anyone, directed by David Corben in 2017. Bruce is grateful to have the very talented and experienced Peta Beattie as director in The Fox on the Fairway, sixteen years after they performed together in the BATS production of The Bear by Chekov. BATS Theatre Company Inc. is pleased to have Hayley as a member and new on the BATS’ stage. The last time she stood on a stage was twenty years ago when she was in a dance troupe for a musical theatre group in the United Kingdom. Having moved to the Sunshine Coast two years ago and auditioning for the role of Pamela, Hayley never dreamed her first acting role would be so big! She has welcomed and loves the challenge and is grateful to her co-members for their wonderful support. Hayley has had a big year of personal and professional change, including leaving her nursing career behind and opening a vintage shop in Buderim – pushing herself out of her comfort zone one more time – and joining BATS! We love having Hayley on board and hope to see her again on our stage. Hayley hopes you enjoy this show as much as she does. Knox performed in Savoyards Brisbane’s productions of The Mikado (2011), Miss Saigon (2012) and The Pirates of Penzance (2013). With BATS, he appeared in the Agatha Christie classic And Then There Were None (2015); the award winning play by Rob Attenborough, Senses Working Overtime (2016); the pantomime Red Riding Hood (2017); and the drama Night Must Fall by Emlyn Williams (2017). BATS Theatre Company is delighted to have Knox back in a performing capacity as he has been a BATS Committee member for a couple of years and is now in the role of Vice President. BATS Theatre Company Inc. welcomes back to the stage Nan Cameron performing in the role of Muriel Bingham. Nan last performed for BATS in the childrens’ pantomime Red Riding Hood, in January 2017. She has loved theatre since appearing in The Admirable Crichton and also enjoys singing in choirs with her husband Knox. Nan has been a BATS member for several years and recently joined the committee of BATS as Secretary. Ewen started his acting career in the fourth grade where his first breakout role was his school’s production of the musical Barnum, where he played the important role of a Tiger number 3 (who had a whole 2 lines!). He was eventually cast in bigger roles in subsequent school musicals, which started his lifelong passion for performance and theatre. BATS first recognised Ewen’s talent in 2015 when he participated in the season of short (ten minute) plays. This led him subsequently to perform in the one act award winning play, The Knock on the Door, by Bruce Olive; the Agatha Christie classic And Then there Were None, and most recently in 2017 the comedy A Little Murder Never Hurt Anybody by Ron Bernas. Ewen has immensely enjoyed his time with BATS Theatre Company Inc. and cannot wait to perform in more plays with this group. This is Kyria’s second play with BATS, having also performed in our most recent production Romeo and Juliet. During her time at University in Brisbane, she was a member of the mass ensemble for the productions of both Hairspray and Grease with Harvest Rain Theatre Company. She also performed in musicals in her hometown of Bundaberg, such as Into the Woods, Fame and 13 the musical. Kyria is very happy to continue her passion for theatre by teaching dance and drama to high school students on the Sunshine Coast. BATS welcomes back Kiti who has performed in a number of plays on this stage. She has performed in many plays including Cinderella, Long Story Short (2015), Million Dollar Question, and Old Fashioned Manors, to name a few. Kiti asks ‘Why do we have “tongue twisters” when we have Shakespeare?’ – she recently performed in Romeo and Juliet in June 2018 playing the Nurse, and describes the ensemble as like a bag of ‘mix-ups’. Thanks Kiti, and BATS loves having you back on board in the capacity of our Sound Technician for The Fox on the Fairway. We are sure we will see more of Kiti in the future.